An innovative dual-action formula to swiftly neutralise unpleasant odours. Easily freshen the air with a light fragrance. 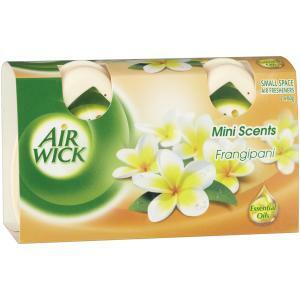 Air Wick® Mini Scents has a dual action formula to neutralise unpleasant odours and fragrance the air. The light, fresh fragrance of Frangipani delicately enhances the atmosphere of your home and lasts for weeks.Frangipani is an uplifting fragrance capturing the essence of a summer breeze; the light scent of frangipani petals is blended with sun-ripened fruit and a hint of precious wood.